After the implementation of Real Estate (Regulation and Development) Act, 2016 major changes can be seen and felt in the field of Real Estate. The Home Buyers who had spent their hard earned savings in buying the property were being harassed by the errant builders, however after Real Estate (Regulation and Development) Act, 2016 came into force, the errant actions of the builders are put under strict vigilance. Under the Real Estate (Regulation and Development) Act, 2016, the State government is required to establish Real Estate regulatory authority for the regulation and promotion of the real estate sector in the State. The newly born RERA has spread its wings and roots in the state of Gujarat, which has witnessed significant changes in the field of real estate sector and topples the list after Maharashtra and Uttar Pradesh. 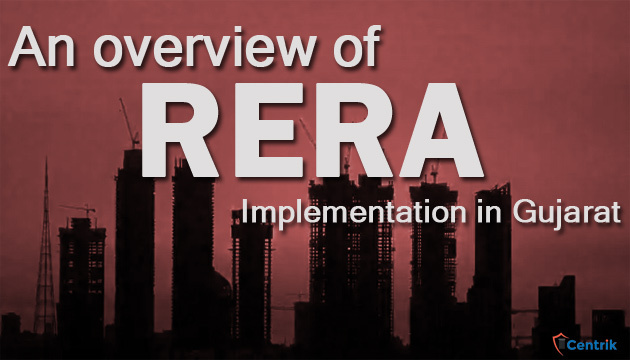 After the implementation of the RERA Act, the State of Gujarat has notified its final Gujarat RERA Rules, 2017 on 29.10.2016 which prescribes regulation, form and process for – RERA registration by Builders and agents; RERA authority constitutions; Filing complaints before RERA Authorities and the Complaint redressal system. It is prominent to note herein that till date overall 3880 real estate projects have been successfully registered under the Gujarat RERA and on the other hand the Authority has issued certificates to 702 agents. By doing so the Gujarat RERA has bagged 3rd position in the registration of the projects in between the 15 states which has successfully implement RERA. That apart from the above, the Gujarat RERA has been successfully adjudicating the grievances of the home buyers who are distressed by the immoral actions of the builders, which has been made more easy with the launch of the web portal of Gujarat RERA. Filing of the complaint is now an easy task which can be done by filling an online form along the requisite fees. RERA complaint in Gujarat can be filed before following authorities depending upon the kind of grievance. (i) COMPLAINT BEFORE RERA ADJUDICATING OFFICER – Any complaint relating to claim of interest and compensation against the builder, which is covered under section 12, 14, 18 and 19, of RERA Act, 2016, can be filed in form ‘B’ before Gujarat RERA Adjudicating officer, with a fee of Rs.1000/-, which is to be paid online. The RERA Adjudicating officer shall, after following the prescribed procedure, dispose the complaint within 60 days of filing. If it is not disposed in said period, the officer shall record the reasons. (ii) COMPLAINT TO GUJARAT RERA AUTHORITY – All those complaints which are related to the violation of the of the provisions of the Real Estate (Regulation and Development) Act, 2016 and excluding the complaints filed before the adjudication officer can be filed before the RERA authority by filing the form ‘A’ with prescribed fees of Rs. 1000/-. The RERA Authority shall, after following the prescribed procedure, dispose the complaint within 60 days of filing. If it is not disposed in said period, the officer shall record the reasons. (iii) COMPLAINT TO GUJARAT RERA TRIBUNAL – RERA tribunal is second appellate authority. Any person aggrieved by order of RERA authority or adjudicating officer may file complaint to Gujarat RERA tribunal in form “A” within 60 days from the date of receipt of such order, after paying the prescribed fees of Rs. 1000/-. The RERA Tribunal shall, after following the prescribed procedure, dispose the complaint within 60 days of filing. If it is not disposed in said period, the officer shall record the reasons. However, it is advised that the services of a professional be hired for the adjudication of the grievance as RERA Act has very new existence in the market, it is difficult for layman to file the complaint and get the legal remedy for their grievances. It can be concluded by saying that Gujrat RERA has set a benchmark for itself to proceed and flourish higher by resolving the issues of the aggrieved home buyers so that it can attain the first position in the real estate sector by bringing a remarkable revolution through its orders and rules & regulations.